ORLANDO, Fla. (Jan. 10, 2018) — FOX Sports Florida, the exclusive television home of the Orlando Magic, today announced Lisa Leslie has joined its roster of Magic on-air talent for the remainder of the 2017-18 season. In her new role, Leslie will serve as studio analyst on select Magic Live! pre- and postgame shows. 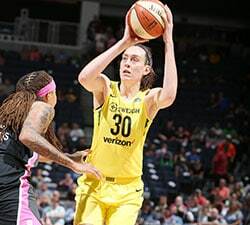 Leslie, a three-time WNBA MVP, two-time WNBA Champion, and a four-time Olympic gold medal winner, comes to FOX Sports Florida after serving as a commentator for ESPN, FOX Sports Net, Turner and NBC. Leslie made her debut during last night’s Magic Live! pregame show and will return this evening at 7:30 p.m., alongside host Paul Kennedy, as the Magic get set to battle the Milwaukee Bucks. 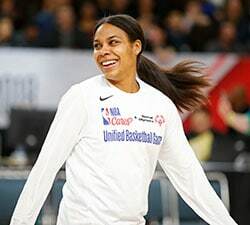 Leslie, a Los Angeles, California native and University of Southern California graduate, had a highly decorated WNBA career, earning two WNBA Finals MVP awards, two Defensive Player of the Year awards, eight 1st Team All-WNBA selections and three WNBA All-Star MVP awards. 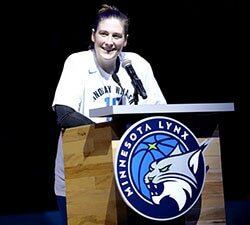 Leslie was the first WNBA player to win the regular season MVP, the All-Star Game MVP and the playoff MVP in the same season and was the first woman to slam-dunk in a professional game. In 2015, Leslie was inducted into the Naismith Memorial Basketball Hall of Fame. Leslie became a commentator for ESPN in 2004, and has since been an in-studio sports analyst for ABC, Turner, FOX Sports Net and NBC.